A dark and twisted adventure that takes the player deep into the depths of the human psyche - both a truly rewarding and at times painful experience. 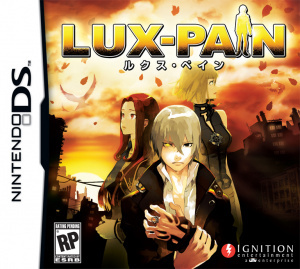 Lux-Pain has a tried and tested set-up common in many Japanese visual novels; an idyllic suburb of a Japanese city where all is not what it seems. Fans of the genre will be pleased by the wealth of different settings and characters available to interact with and some of the dialogues are witty and actually pretty interesting, an achievement for any visual novel in particular when it has been translated from another language. I'll come on to discuss the game's dialogue in some detail later. The game's story-line is, to put it lightly, rather complicated and, upon beginning the game, the player will most likely be utterly confused as to exactly what is going on.There is no introduction, besides the opening FMV, and no tutorial on the game mechanics. The player is left to discover for themselves how the game works and it's actually rather refreshing not to have to sit through a long tutorial. On the other hand, some of the finer points of the game, namely the "Sigma" system, could have done with being explained. After some tense opening scenes it comes to light that the main character, Atsuki Saijo, has psychic powers and is working for an organization called FORT which aims to investigate and eradicate the "silent," an infection that drives people to do invariably evil things, the first example of such being the rather grisly mutilation of several animals. It is here that the player is first prompted to use Atsuki's psychic powers to try and work out what went on at the scene of the crime, and furthermore get a feeling for the type of emotions and feelings that were being felt at the time. 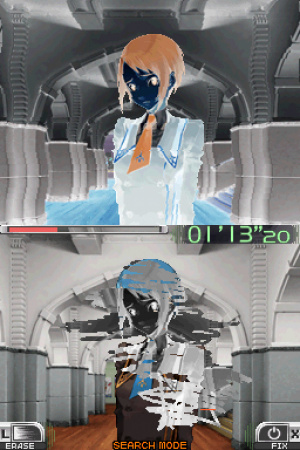 The player is then introduced to Atsuki's special power known as Sigma, which allows Atsuki to break away the barriers of the physical world and gain a deeper understanding of the places and people around him. 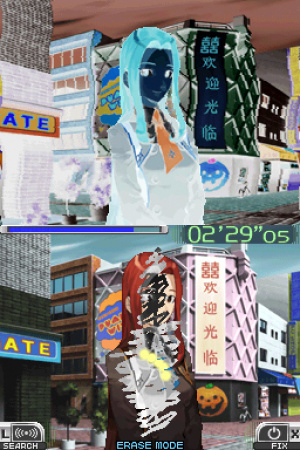 The player uses the touch screen to literally "scratch away" the surface of a person or area and locate shinen, small particles which contain fragments of memories or thoughts. Kisaragi City, the setting of the game, seems to have fallen victim to the infection of silent and it is Atsuki's job to try and locate "the original" - the one who is infecting the denizens of the city and causing them to do unspeakable things. The mood of the game is generally quite sombre and at times it can become tedious reading the minds of the game's various characters, all of whom seem more than a little mentally disturbed. While some of the game's characters are somewhat clichéd, the developers mostly succeed in creating an absorbing and interesting environment filled with characters who all have their own individual personalities and attitudes. 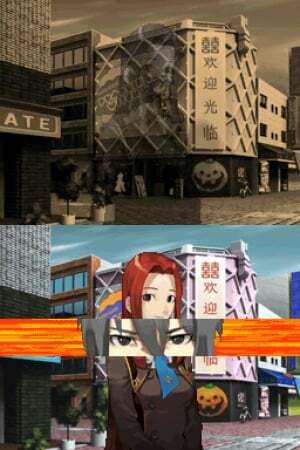 The game features on the whole lush backdrops and detailed locations; there are many, many locations to visit and all of these are generally rendered nicely. Some of them appear a little generic, such as the classrooms featured in the high school, however this is only a small gripe. 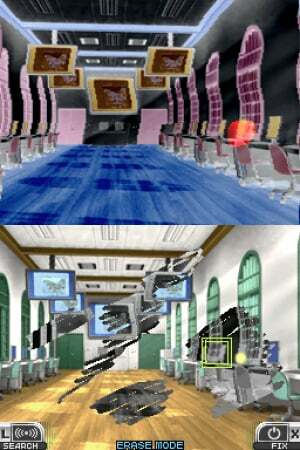 Unlike other games of the same genre such as Phoenix Wright, the player has very little interaction with the locations themselves and the purpose of moving from place to place is usually to speak to a character or locate a stray shinen. Moving to a different place is done via an overhead map, with areas of interest marked with an orange marker and deviations from the main quest marked in blue. The game features many asides in which the player may learn more about the huge cast of characters and develop their relationships with them - there is a location in the game which allows you to view how well you get on with each character and what they think of you, an amusing little diversion. Relationships are developed through what you make Atsuki say and how you make him react to certain events. Keep in mind that Lux-Pain is not a dating simulator and therefore this level of character development is by and large an optional "side-quest" of sorts, and has little effect on the story. Due to the game's main quest being literally pinpointed for the player, it can eventually come to feel quite linear. If you're a player who likes a challenge then the direct nature of Lux-Pain may not be for you. On the other hand, if you hate wandering from place to place and re-examining the same scene for clues - this could be exactly the game for you! The character design and animation featured is also very pleasing and fans of Japanese animation will no doubt be impressed by the various different looks of each character. The biggest issue that Lux-Pain faces is sadly a common feature of this genre: poor localization. The translation was apparently handled by Killaware themselves, and overall there's not too much to fault with the actual translation from Japanese to English; everything is relatively smooth, albeit sometimes a little unidiomatic. However, the game does feature more than a few typos which detract from the polished feeling a published game and visual novel should have. The game features voice-acting for most of the crucial scenes and while this is impressive, sadly the text on-screen and the spoken word rarely match up, creating confusion and at times frustration. Most of the time the difference isn't too big, though occasionally the characters will say something completely different to the subtitles. It would appear that the translation of the text and the recording of the American script were not done together, something that's extremely apparent throughout the game. Sadly, as is often the case, Lux-Pain loses a lot in the translation process. On a brighter note the game features pretty good music and manages to utilize it to conjure up some good atmosphere in each scene. There is also a wealth of different tracks and sound effects, with most locations and characters having their own background music. Overall Lux-Pain is a rather odd title with a truly interesting if, at times, genuinely disturbing story-line. While the plot at first may seem quite strange the game manages to create an engaging and rewarding experience, with its complex story-line unfolding as the player delves deeper into the psyche of the game's various characters and locations. The game's visuals and score are on the whole reasonably impressive and work to create a convincing and fluid world. The gameplay is relatively simple and involves quite minimalist interaction: the game truly plays like a visual novel and therefore may not be for everyone. The biggest problem faced by Lux-Pain is the poor effort that appears to have been made to localize the game effectively and this lets down an otherwise very engaging title. Wouldn't have even considered this before; now I'm mulling it over. Might get this at some point down the line. I'll probably pick this up later when it's cheaper, as localization in my visual novel games is very important to me. Wow, I was expecting another 4/10. I had this feeling NL wheren't going to pick up on any niché titles. I'm glad I've been proved wrong! No niche titles? At the moment on the frontpage I see Retro Game Challenge, Virtual Fishing, Flower, Sun and Rain and Samurai Shodown Anthology! This isn't really a game. More like an inter-active story. Way too niche for me..
finally, a review that's actually put some effort into playing Lux Pain! Most of the reviews I've read have been really negative; and most of the time it's because the reviewer has only played the game up to the first chapter or so, and decided it's rubbish because it's a visual novel and there's not much action! Quite a lot of gamers will probably find this game not to their liking, But It's surprisingly addictive! I've had many a sleep-less night playing this! I absoulutely love this game and I'm really hoping more visual novels are brought out in the west!! Thanks for picking up on this title and giving a rating it deserves! Sorry to hear about the poor localization part... The original is really an interesting game to play!! Now I'm scared to choose this game..